For her final project in the Woodrow Wilson Fellowship, Gillian Waldo ’19 (film and media studies) directed, shot, and edited the film, “I Know What I Saw.” The film, which takes viewers on a cross country journey through rodeos, deserts, and motels, is now streaming on NoBudge. NoBudge is a platform that spotlights short films and indie features. Join Humanities for All as three academics at different stages of their careers share their unique approaches to queer theory and discuss how they entered into studying the humanities, obstacles they faced, and how they developed their research interests. 5 p.m., April 23 in the Levering Sherwood Room. The Dean’s Undergraduate Research Award (DURA) will now be called the Dean’s ASPIRE Grant. ASPIRE Grants are designed to promote independent research projects among our exceptional undergraduate students in the Krieger School of Arts and Sciences. These awards, which range from $500 to $4,500, enable undergraduates in KSAS to pursue original research, work closely with a Hopkins faculty mentor, and advance knowledge for the world. Woodrow Wilson, DURA, Bander, Clinger, and Albstein Award Applications Now Open! 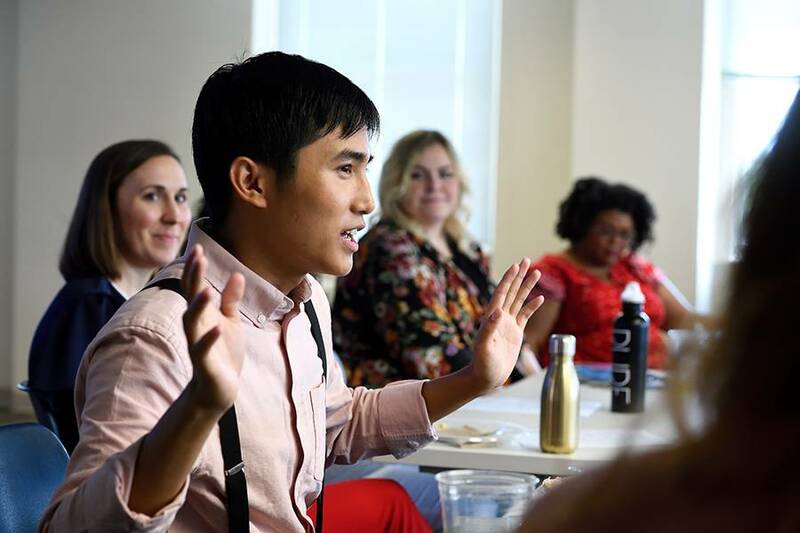 Many of the Humanities Collaboratory participants were in the midst of mapping out their futures, and for them, the summer was a turning point. Read their stories to learn more about their unique research projects, what they learned during the 10 weeks, and what they plan to do next. Undergraduate Award Application Deadlines Extended! Applications for the Woodrow Wilson Award for Rising Sophomores, the Dean’s Undergraduate Research Award, the Bander Family Fund, and the William F. Clinger Jr. Award have been extended to March 19! Applications are now online for CCBC students who are interested in applying for the CCBC/JHU Andrew W. Mellon Humanities for All Summer Research Experience this summer. The application deadline is Feb. 2. Applications for the Woodrow Wilson Award for Rising Sophomores, the Dean’s Undergraduate Research Award, the Bander Family Fund, and the William F. Clinger Jr. Award are all open now through Feb. 23. The Woodrow Wilson Fellowship application for rising sophomores is now online. Current freshmen interested in pursuing independent research projects are encouraged to apply. Applications are due Friday, April 21 at 11:59 p.m. EST.